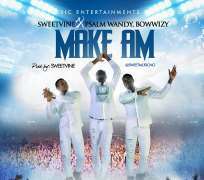 "Make am" also popularly known as "Husler's song" is another incredible music by the top singer "Sweetvine" Featuring Psalm Wandy and Bowwizy under Sweet Music Entertainments and Records. The Title of the song is"Make am" which gives all hustlers hope for tomorrow. The song is produced by Sweetvine.